During the holidays I baked a couple of cheesecakes, something I hadn’t done since my kids were very young. Way back then, before I had clue how many things can go wrong with a cheesecake, I just followed the directions and voila! Perfect cheesecake. I even used the water-bath technique, which is a fairly tricky method. It may be true, on occasion, that what you don’t know – won’t hurt you. It was certainly true on this occasion because it came out wonderful. It was a chocolate cheesecake and I remember being amazed that I pulled it off. It was not only delicious, it was one of the most beautiful culinary concoctions I’d ever made, second only to that Norman Rockwell turkey at Thanksgiving. So, with this one cheesecake under my cooking belt I got up the courage to try it again. Cream cheese was on sale for the ‘baking season’, so I stocked up; using two and a half pounds of cheese per cake gets expensive fast. There are also eggs, which aren’t cheep (pun) sugar and my secret ingredient, heavy cream. A ten-inch cake weighs about as much as a gallon of milk but making it fresh and with quality ingredients makes all the difference. So far I’ve made three more and even sold two of them. I hadn’t thought about how much to charge – I didn’t expect them to be good enough to sell: was I wrong. After taking into account my time, the cost of ingredients and baking time I settled on twenty dollars for a half and thirty-five dollars for a whole. So far – so good. Folks I’ve sold them to don’t even bat an eyelash at the price. I went to the local supermarket and priced a cheesecake that was half as thick with a list of ingredients that I couldn’t even pronounce. 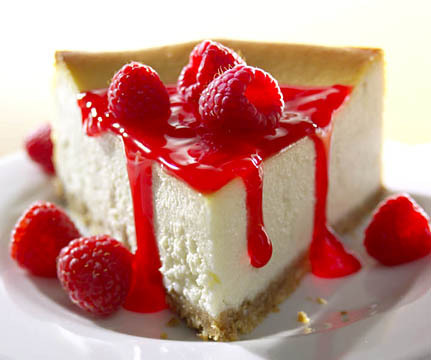 Cheesecake should be simple and seductive. There is nothing seductive about paying twice as much and getting half the amount and without the freshness and quality that I have in mine. I haven’t attempted another chocolate one since that first cheesecake all those years ago, but that’s next. I also have a recipe for a white chocolate with raspberry swirl. Topped with fresh picked raspberries, I think this one would make a wonderful summertime desert. The process of making cheesecake is time-consuming but as it turns out, all I have is time. So, here I go – saving the world, one cheesecake at a time.